From all of us at deVine’s to you and yours, we wish you a Merry Christmas and a Happy New Year in 2015 with all the best for happiness, good health and prosperity. May good fortune and luck follow you wherever you go and in everything you do for the coming year. We thank you for your continued patronage! Every year, deVine Wines and our neighbors on 104th-St. get together to say a collective “Thank You!” for your ongoing support. 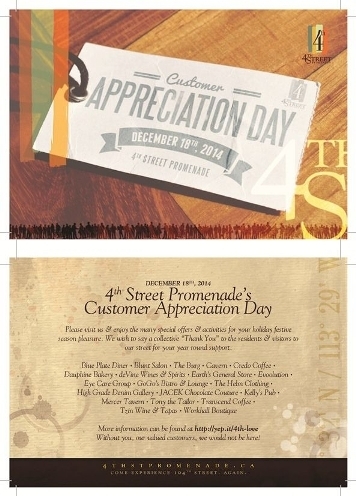 This year, Customer Appreciation Day will be held on Thursday, December 18, 2014. Saying Thank You at deVine Wines: deVine Wines will be offering our customers a 10% discount on all regular priced wines and spirits. The sale will run all day, starting at 10:00 AM until we close at 9:00 PM. The sale excludes beer and wines stored in our vintage keeper and vintage room. Savings of up to 30% will be extended to a select group of wines. Customers can enjoy free tastings between 2:00 PM and 8:00 PM while they shop. Great wines and premium spirits can be sampled while you browse. Customers can enter to win a free gift basket of wine when you visit us in December. The draw will be made on December 18, 2014. 2:00 PM – A special ceremony is being organized for the winter opening of the Pocket Park located at 10120-104 Street. The park can be found just north of Jasper Avenue, on the west side, between the alley and the Icon I Tower. City officials, park personnel, representative merchants and members of the Downtown Edmonton Community League and the Downtown Business Association have been invited to dedicate our new park. To celebrate winter and the festive season, a fire barrel will be lit and festive season lights turned on. Come and enjoy a choir. Perhaps you can even meet a special guest from as far away as the North Pole! You never know who you can run into on 104th-St.! 4:00 PM – Our first choir is scheduled to perform at various points on 104th-St. and in businesses. Hot chocolate will be served in the Pocket Park courtesy of the Coast Edmonton Plaza Hotel. A fire pit will be available to roast marshmallows and toast your buns in the park! Knitwear for the Edmonton Emergency Relief Society can also be dropped of at the Pocket Park. 6:00 PM – The second choir will start their performances. Activities in the Pocket Park will continue until 8:00 PM. We look forward to seeing everyone on our street on Thursday, December 18th. Since 1988, the popular American Wine Spectator magazine reviews 18,000 wines per year, and they publish a Top 100 list mid November of each year. There is always a rush to get the top wines this year is no exception. The 2014 edition of the Wine Spectator Top 100 is surprising with the number of Portuguese wines chosen – never before have this kind of love (3 of the top 4 and 4 in the top 13) been shown and rightly so – 2011 is a legend of a year for both Douro reds and their special long-aging Vintage Ports. Some interesting tidbits, the average score of the wines in this year’s list is 93 points, and the average price is $47. Sadly once again, no Canadian wines represented (we can only hope for next year), though it is nice to see Israel represented. We have a limited number of wines (and in limited quantitites) and you can check them out here. Do purchase them early as they tend to go fast and compare your taste with those of the critics. deVine as usual will be doing our annual stand-up Wine Spectator Top 100 Wines tasting – $50, where a selection of wines that made the grade will be featured at our first tasting of the new year. Be sure to sign up early to avoid disappointment as this sells out annually as it makes for a great Christmas present.